Living in rented accommodation, we are not able to decorate our home, but this doesn't stop me wandering the wallpaper aisles in the local DIY stores admiring all of the pretty papers. I't also doesn't mean that I've not taken advantage of the patterned papers available. Most people's immediate thoughts when it comes to wallpaper are of course walls, but it can be used to brighten up so many other things around the home. I have used wallpaper in this instance to uplift the drawers in our bedroom, by cutting the paper to shape and lining the inside of the drawers with it. Much more colourful than a plain white drawer wouldn't you agree! 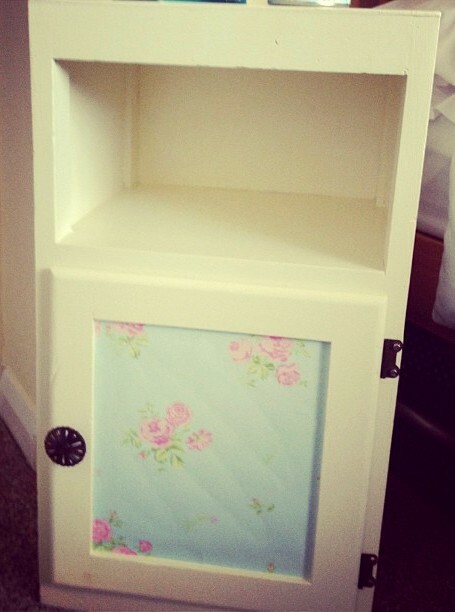 I've also up-cycled this bedside cupboard by adding wallpaper to the front of it. As this particular project was such a small one I've used a sample for this makeover, so it has literally cost me the price of the glue and my time, which wasn't very long at all. There are so many projects using wallpaper, you only need to take a look at Pinterest to be inspired by it's many uses. Love the paper you have used for the cupboard door. It certainly adds some colour and femininity! Lovely, Gem!